By no means am I the gaming guru beyond this operation we have here (you already knew that), but that doesn’t mean my boring self can’t get down with some handheld fun from time to time. And even though I leave gaming duties up to DL team members who play all the new hotness with regularity, we still thought I should share the games that have really grabbed my attention over the years. Tim already gave us his 5 games that you can’t go wrong with, but somehow (unsurprisingly), none of his made it onto my list. You see, I look for games that can be picked up, played instantly without any fuss, and typically don’t involve long, drawn out stories or power-ups or in-app purchases. If I have a minute to game, I need it to be a game that I can pick up and play, and then put down again at a moment’s notice. Ready to see my five? My addiction to Granny Smith from 2012 until mid-2013 became a running joke around these parts. It was, for a long time, the only game I ever talked about. As new titles came and went, there was Kellen, still re-playing Granny Smith over and over. I haven’t played the game in well over a year now, but it still tops my list. No game in the history of my mobile life has taken up as much time as Granny Smith. What is Granny Smith? It’s a platformer with solid graphics and physics, all led by a granny chasing a pestering little boy who wants to steal her apples. Seriously, it’s that silly. There are jumps, cane swings and slides, flips, vintage replays of levels, dog characters, space adventures, and more. It’s the most random, yet completely amusing game you will ever play on mobile. 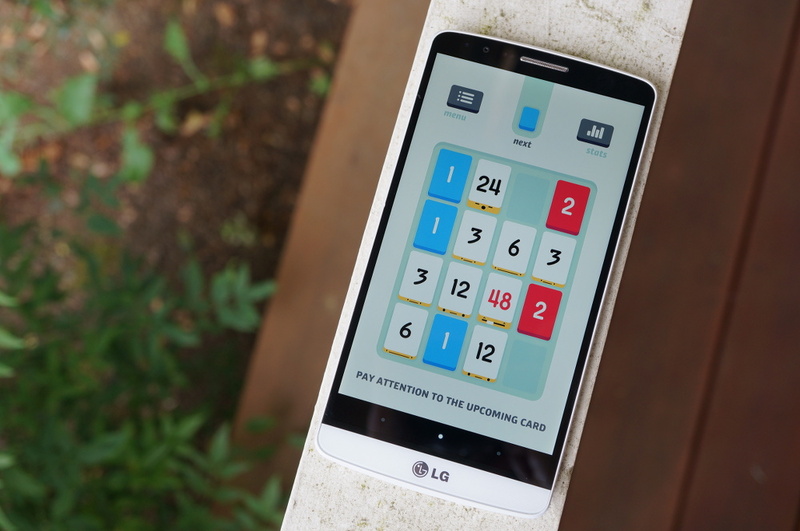 Is Threes the best puzzler ever created? Maybe. By combining tiles of 1s and 2s to create 3s on a board, to matching up 6s, 12s, 24s, 48s, 96s, and more, you constantly grow a score before that board of tiles fills up and you can no longer make a move. It’s difficult, but easy to pick up. The game has a snazzy soundtrack, mostly obnoxious background voices that can be turned off, cloud syncing, and high scores that you can use to compete against friends. This game is insanely addictive and will never get old. I think my wife has secretly been playing it for the last six months. I mentioned in my opening that I rarely play games that involve lengthy storylines, game saves, and what seem like never-ending amounts of levels. There is one exception I seem to make, and that’s with tower defense games. Yep, I’m a sucker for a good tower defense title. The Kingdom Rush titles are some of my favorite, with Frontiers topping the list. In Frontiers, you get classic tower defense features, but they are set in medieval, yet Game of Thrones-like times. You will confront wizardry, flying demons, monsters, aliens, pirates, and more, as you try and defend your maps. To defend, you get to upgrade heroes with special powers, build archery towers that can conquer the world, use your own forms of magic, enlist and power-up soldiers, and create robotic-firing-artillery, to name a few of your forces. The graphics are solid, characters are memorable, and there are a number of levels and game modes to keep you busy for a while. Stickman games, as silly as they seem, are always entertaining. Super Stickman Golf and its sequel are classics, created by respected game studio Noodlecake, makers of popular games like Velocispider, Mikey Shorts, and most recently, Gravity Duck. The game features you as a stickman, playing rounds of golf in a 2D world filled with obstacles, multiple levels, power-ups, and challenging environments. Stickman Golf is really like a puzzler in disguise. The game is simple to start with, but once you play and realize that there is a sneakier way around each hole, don’t be surprised to find yourself constantly working to improve your scores. This is another game that can be picked up and played without much work, but will grab you for hours if you let it. A top 5 games list doesn’t seem legit in 2014 if it doesn’t contain at least one zombie title. Into the Dead is my pick, a game that is all based around how long you can run and survive a zombie apocalypse. As an endless, first-person runner, you are greeted with impressive graphics, in-your-face zombies, creepy shadows and noises, all sorts of weapons to use against the undead, and high-score challenges with friends. The game is bloody, graphic, and awesome. Seriously, install this on a tablet, turn off the lights, crank up the volume, and tell me you aren’t slightly creeped out. The game has been around for a good year or two, but it remains a solid install if you ever need some quick zombie action. Earlier, we asked for your five favorite Android games. Be sure to head over to that post and leave your response.